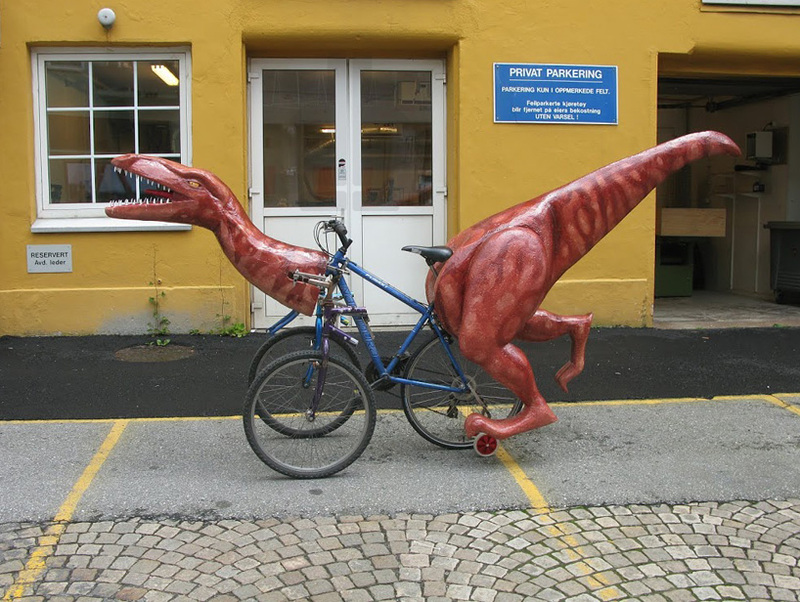 Just when we thought we’ve seen it all when it comes to strange and unusual bicycle designs, from DIY creations to futuristic concepts, along come a handmade dinosaur bike, helmets that look eerily like human scalps and bikes that you ride while relaxing in a hammock. 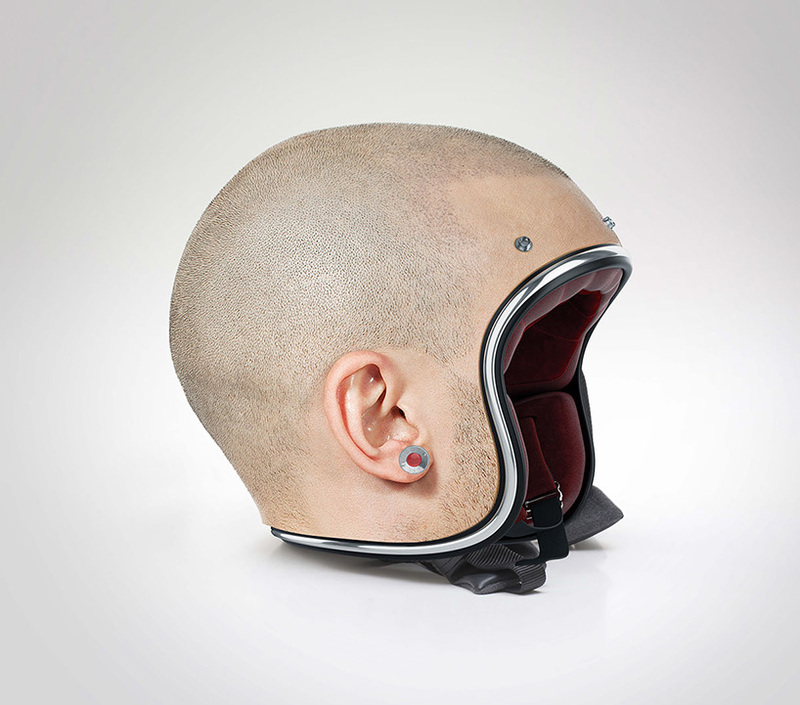 Giving a whole new meaning to the term ‘helmet head,’ these jaw-droppingly-realistic helmets fuse cushioned head protection with the look of a naked scalp. Created by Dubai-based digital designer Jyo John Mullor, the trompe-l’oeil helmets are custom-made to blend seamlessly with the user’s head so that from afar, it looks like they’re not wearing anything at all. Another unusual helmet design is invisible in a totally different way. 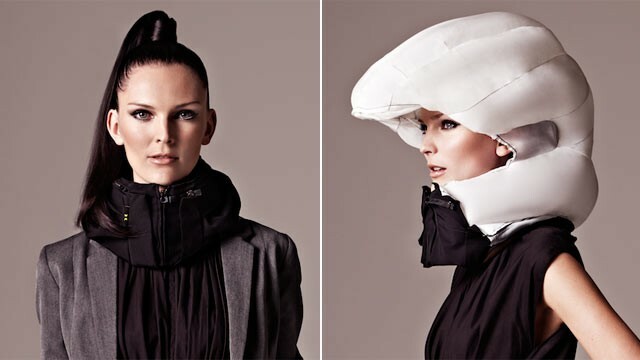 The Hövding helmet looks like no more than a nylon collar, leaving the head entirely exposed until the moment that a sensor embedded within the fabric realizes you’re about to crash. 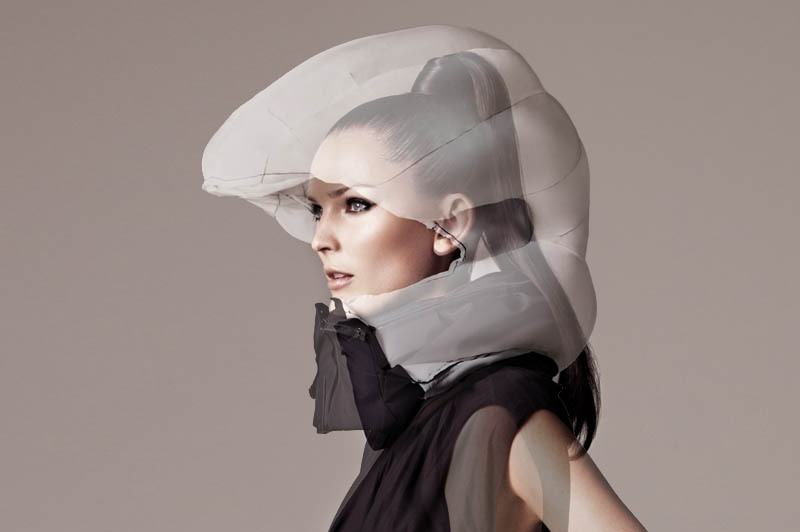 Then, the helmet appears within seconds, inflating just before impact like an airbag. 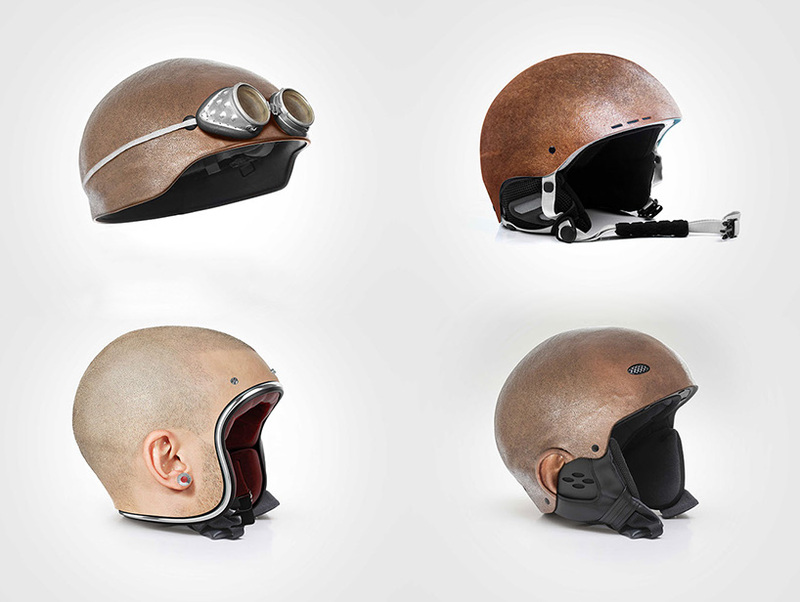 As futuristic as that sounds, the helmet is entirely functional and available for purchase. 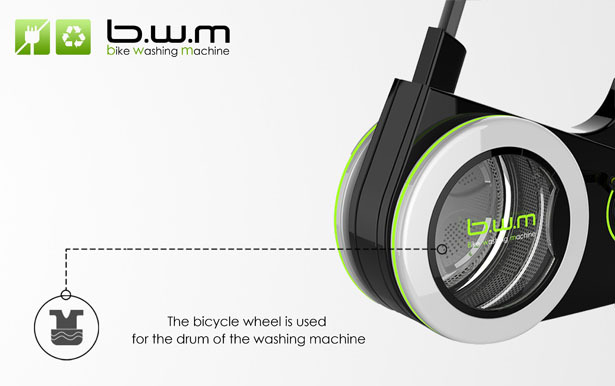 Industrial designer Mitch Shivers of the Philippines is just one of many people who have realized that a bicycle is actually a fairly efficient way to clean laundry. 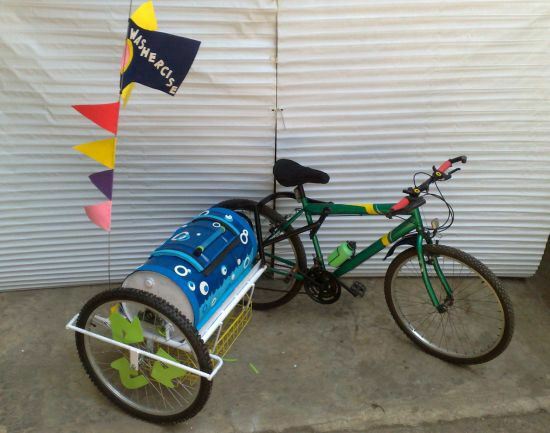 His bike-powered washing machine attaches a drum to an ordinary bike. 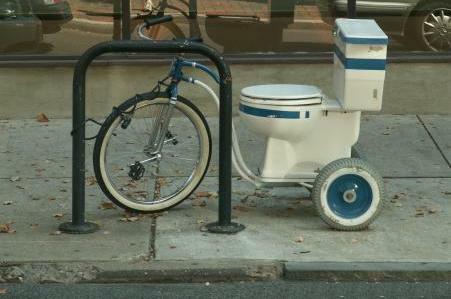 You don’t just have to sit there stationary and pedal it to make it work; you can ride your bike like normal (keeping in mind that you’ll require quite a bit of extra width on the road, of course) and get your wash done at the same time. 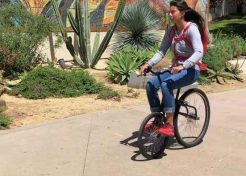 If you’re just using your bike to get some exercise and not for transportation, there’s a concept that works for that, too. 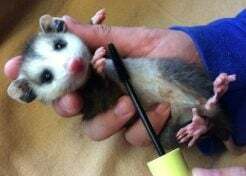 The B.W.M. 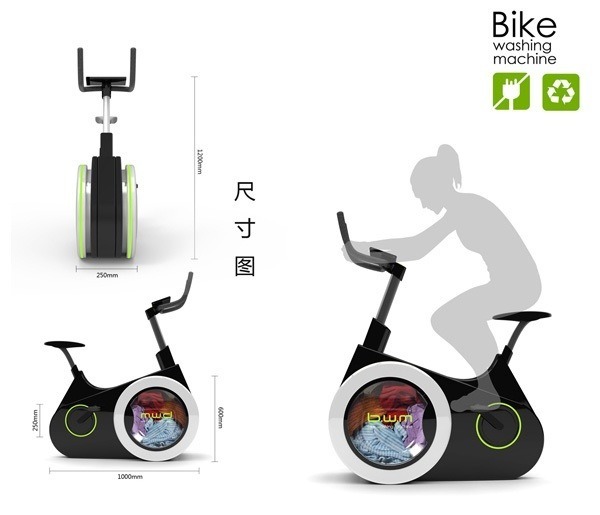 bike washing machine is an entirely human-powered way to do the wash that’ll also motivate you to stick to your workout schedule. 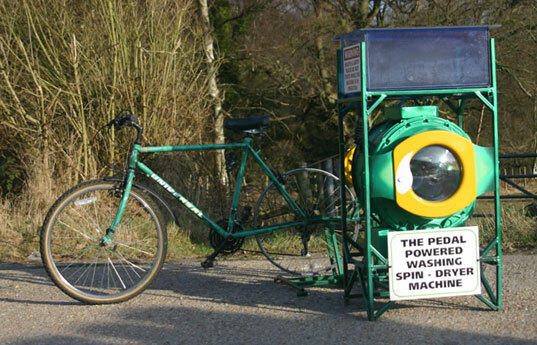 The Cyclean is a lower-tech illustration of the same concept, made of parts salvaged from scrap yards and dumps, stripping down a washing machine to its drum and shocks and attaching it to an ordinary bicycle. 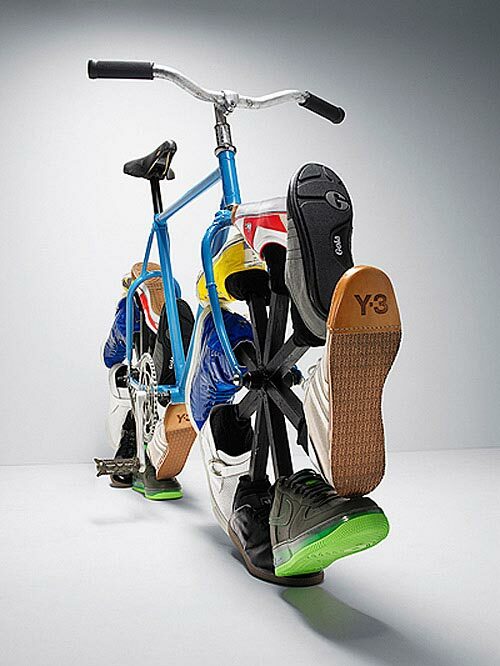 Walk and ride a bike at the same time with bicycle wheels made out of a series of sneakers, like ‘The Walking Bike’ by Max Knight, or any number of similar designs that put old shoes to work in a new way. They’re not exactly speedy, but they’re certainly an attention-grabber, and at this point we’ve learned not to ask ‘why’ when it comes to weird designs. 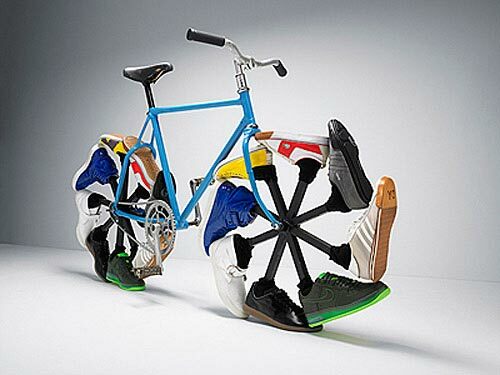 Then there are bicycles that double as works of art. 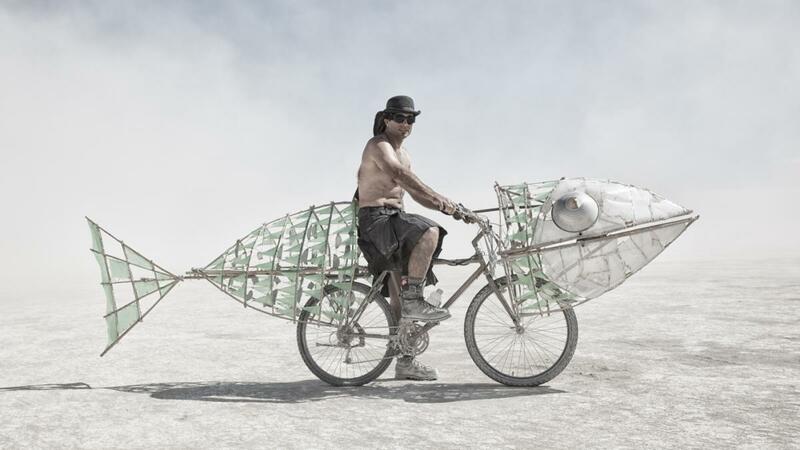 Often made for festivals like Burning Man, these bikes are made to be paraded around and gawked at. 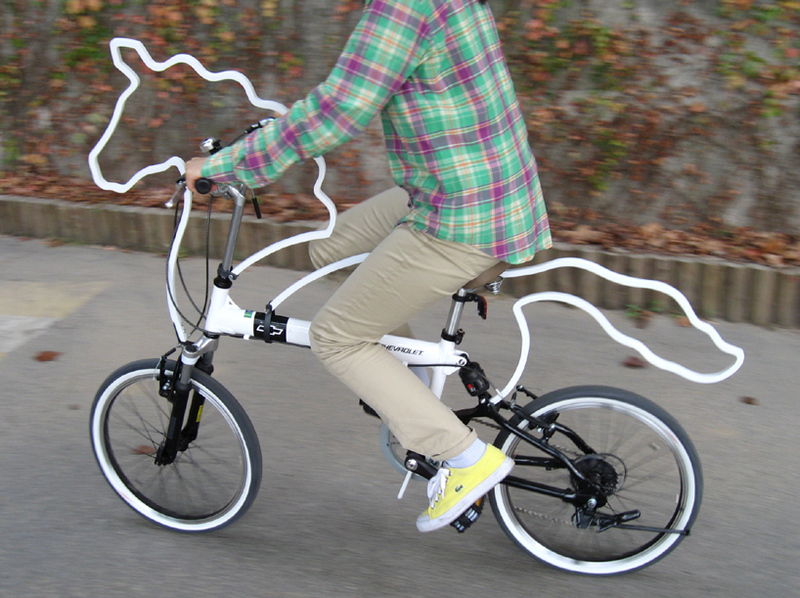 ‘Horsey’ by Eungi Kim is an attachable accessory that can be clipped onto a bike frame to make it look like you’re riding a horse. 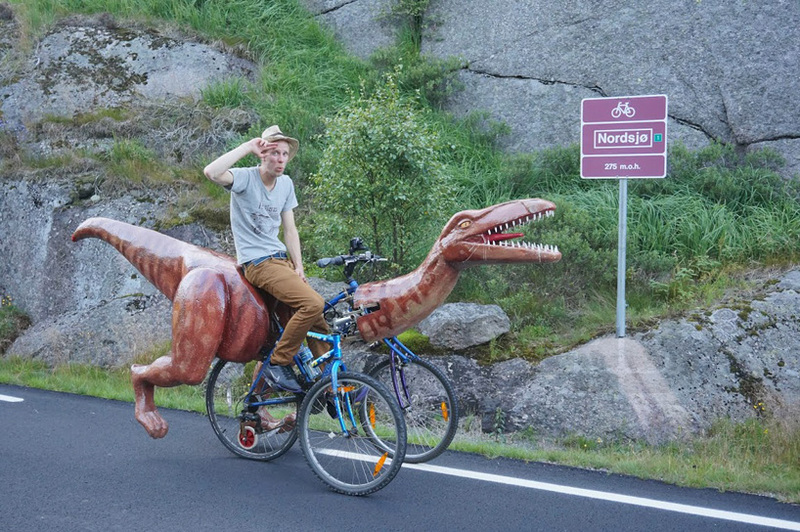 Norwegian artist Markus Moestue hand-crafted a dino bike using styrofoam, and rode it across the country. 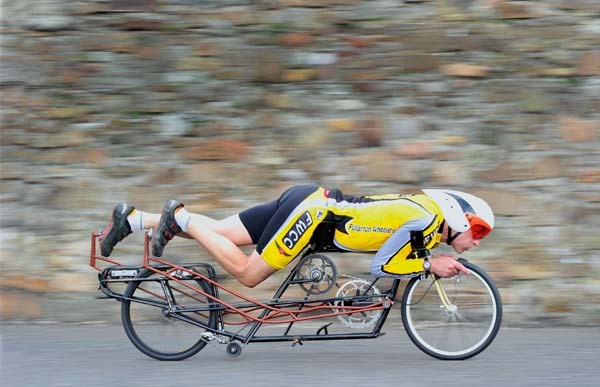 Recumbent bikes, which seat the rider in a laid-back reclining position, aren’t all that unusual. 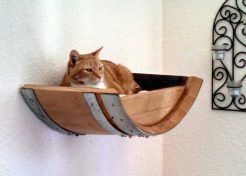 But what about versions of them that flip the rider onto his or her stomach, so they’re practically laying down, hurting down the road head-first? 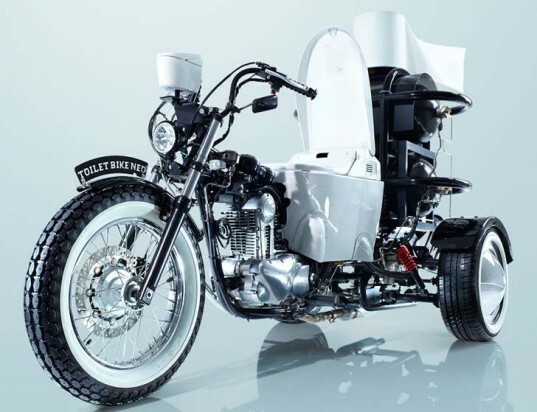 As strange as these designs look, they’re actually made for speed. 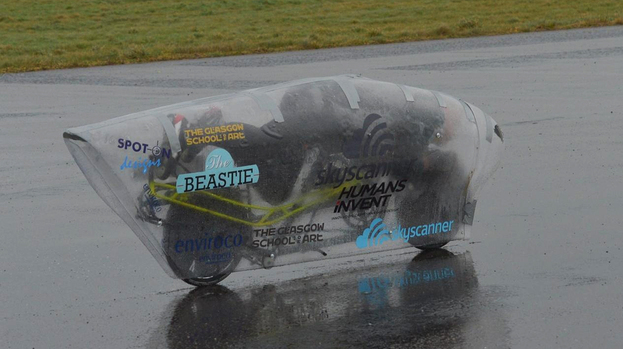 Cyclist Graeme Obree is looking to smash world land speed records for human-powered vehicles on his ‘Beastie,’ which he sometimes covers in a transparent membrane for protection from the rain. 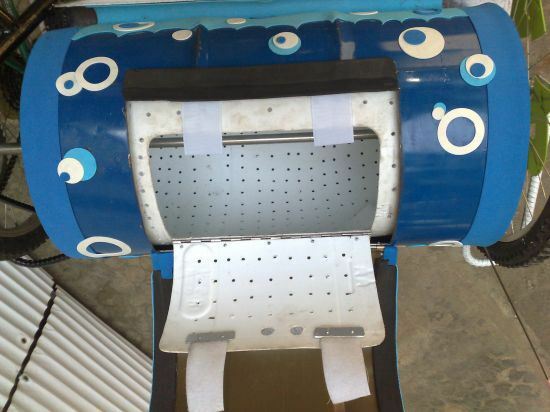 The Street Flyer is a hang-glider for the streets, strapping the rider to an elevated frame with a harness so you feel like you’re flying. 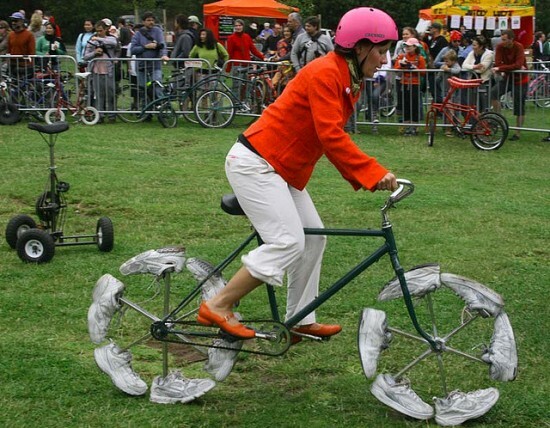 You run to get the bike going, and then lift up your feet and cruise. 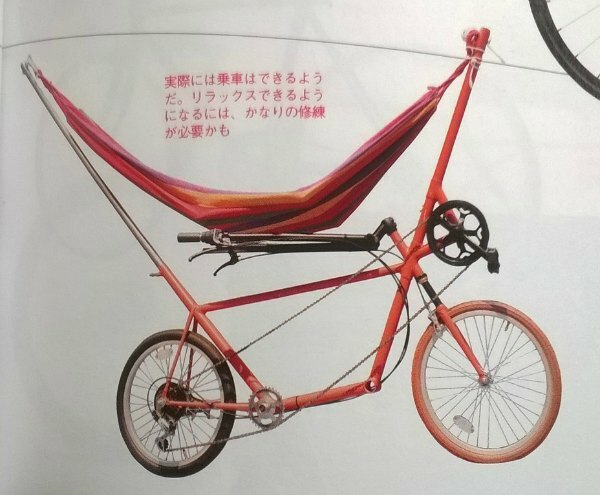 And then there’s this weird Japanese design for a bicycle with a hammock attached to it – how you’re supposed to use that may forever remain a mystery.